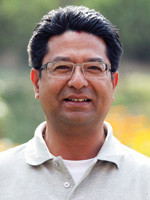 Dr Shrestha holds a Ph.D in Earth Sciences from the University of New Hampshire, USA, and a Master's degree in Hydraulic Engineering from Minsk, former USSR. He previously worked for the Department of Hydrology and Meteorology, Nepal. His main areas of expertise include climate change, glaciers and glacial hazards, glacial lake risk mitigation, atmospheric environment, and hydrological modelling. He was involved in the Tsho Rolpa Glacial Lake Outburst Flood Risk Reduction Project and the scientific team for the preparation of the First National Communication of Nepal to the United Nations Framework Convention on Climate Change (UNFCCC). He has published several papers in peer-reviewed international journals, national journals, and magazines, and is on the editorial panel for Geomatics, Natural Hazards and Risk (Taylor and Francis), and Journal of Hydrology Meteorology (Society of Hydrologists and Meteorologists, Nepal).